JAMAICA, Queens (WABC) -- A Queens man is facing grand larceny charges after allegedly stealing a bag belonging to John Legend at John F. Kennedy International Airport on Thursday. 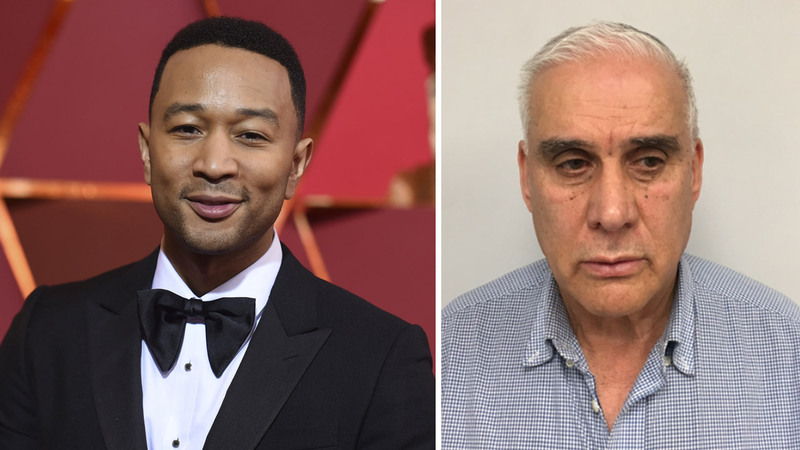 The Grammy- and Academy Award-winning singer had just arrived from France when 63-year-old Agustin Hilario swiped the Louis Vuitton bag from a luggage cart, which had been left momentarily unattended, according to District Attorney Richard Brown. When someone went to retrieve the bag, it was gone. Security footage allegedly showed Hilario approaching the cart and pushing it away from the area before removing the bag, which contained a pair of Cartier panther head cuff links with clear and green stones valued at $25,000, and leaving the scene. Hilario was reportedly identified by a Port Authority police officer who recognized him from the security camera images and contacted him. "I know I should not have taken it," he is alleged to have said. "I made a mistake." He reportedly claimed that he'd planned to take the bag to the airport's lost and found. Legend's bag, which is worth $3,000 by itself, also contained articles of clothing and personal items. Authorities say Hilario returned the bag and its contents to Port Authority police, who reunited Legend with his belongings. Hilario is charged with third-degree grand larceny, third-degree criminal possession of stolen property and third-degree attempted grand larceny. If convicted, he faces up to seven years in prison.